Sign up for free and just shop with AvivaPlus Car Insurance as normal. Our members earned £30,000+ at AvivaPlus Car Insurance in the past month. Cashback will not be paid in conjunction with any other offer, voucher or discount code such as, but not limited to, staff, staff friends and family, or student discounts. However, Cashback will be paid to multi‐policy discount and online discounts. Cashback will not be paid on policies where an Aviva Drive discount has been applied. Cashback will only be paid for one AvivaPlus Car Insurance policy purchase per person within a 23‐month period. Aviva shall not be liable for any failure to comply with its obligations where the failure is caused by something outside its reasonable control. AvivaPlus Car Insurance cashback can be earned simply by clicking through to the merchant and shopping as normal. AvivaPlus Car Insurance Cashback is available through TopCashback on genuine, tracked transactions completed immediately and wholly online. Aviva also reserve the right to change or amend the reward and the structure of the offer at any time. Any decision made by Aviva with regards to this offer is final. Aviva withhold the right to withdraw this offer. Cashback is available to customers who purchase an AvivaPlus Car Insurance policy through TopCashback (the “Affiliate”). If you decide that AvivaPlus is not suitable for your needs and you purchase our Standard product the Cashback you receive will be at the amount promoted for the Regular tier on the TopCashback website on the day of purchase. The Cashback amount awarded will be based on the level of cover you buy, at the amount promoted on the TopCashback website on the day of purchase. The Cashback offer is a reward (the “Cashback”) to be sent to a customer after the successful purchase of a new insurance policy from Aviva Insurance Limited (“Aviva”). You must click the Affiliates link directly to Aviva's insurance website, generate a new quote and make your purchase immediately. Cashback will not be paid if a saved quote is used. 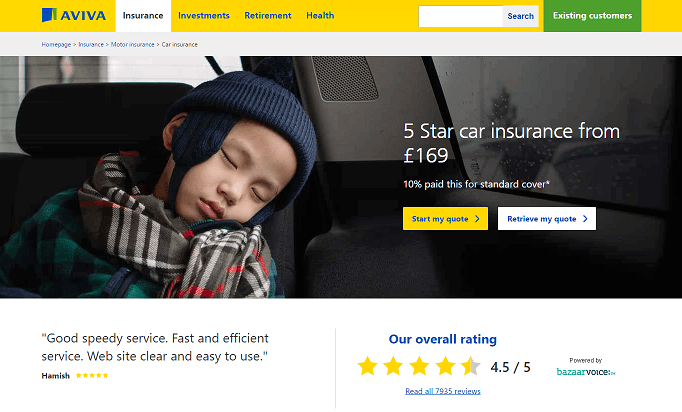 Get great Defaqto five-star rated comprehensive car insurance and make savings when you sign up to TopCashback using the form below by taking advantage of our Aviva cashback deals. Get a quick Aviva car insurance quote in a matter of minutes and you could save up to 18% when you buy online. They have a claims team available 24 hours a day, 365 days a year, and you will get a UK personal claim manager, who will be there if you need to make a claim, offering support and ensuring the whole process is simple and quick. Choose to take out their optional no claim discount protection, meanwhile, and you will ensure your premium price will not rise - while keeping your no claim discount - should you have to make a claim following an accident. With their accident recovery assistance, they will try and make your vehicle roadworthy or take it to their nearest approved repairer, while you can add optional breakdown services. Also included is their uninsured driver promise, which means that if you are hit by an uninsured driver and the accident was not your fault, you will keep your no claim discount and be refunded and excess you paid out. Named drivers who stay claim free are able to earn a named driver discount, which will see them save money if they start their own policy. Add optional extras, such as motor legal protection, while they also provide third party fire and theft protection. Should you have more than one vehicle to insure, you could keep things simple and make savings of up to a third thanks to Aviva MultiCar insurance. Not only are 20% of customers expected to achieve the highest saving, but you will only need one policy for your cars, meaning you will only have to remember one renewal date and manage one set of paperwork. Aviva MultiCar allows you to choose different levels of cover and excesses for each vehicle, while you can cover cars and vans on the same policy. With the no claims discount for each vehicle being kept separately, if one is involved in an accident, the no claims discount of the other vehicle will not be affected. You will still benefit from the uninsured driver promise, while you can add your second vehicle at a time which suits you as they will provide you with a guaranteed quote, even if you do not wish to add a second vehicle until a later date. If you already insure more than one vehicle with Aviva on separate policies, you can transfer them to a MultiCar policy. Aviva want you to be safer on the road, so are challenging you to put your driving to the test with Aviva Drive. Once you have completed 200 miles of driving, the free app - which monitors your driving skills - will provide you with a score out of 10. The bonus is that safer drivers who score 7.1 or more could save an average of £150 on Aviva comprehensive car insurance (40% of safer drivers are expected to achieve this). The app will allow you to view your progress and track your route with the built-in street map, while you will be able to see a summary of all your completed journeys. There is no need for you to do anything as Aviva Drive will detect movement via your phone's GPS and automatically start recording your journey. You can also collect different driving skills badges by displaying how safely you drive, driving at specific times and leaving a review. Use the app to get a car insurance quote anytime and share your driving score and badges with your friends on Twitter and Facebook. If you need to drive another car or van, or you need someone else to drive your vehicle, for a period of between one and 28 days, their comprehensive temporary car insurance, which is backed by Dayinsure, represents a cost effective solution. They can also arrange one-day insurance if you require it for a test drive, have to borrow a vehicle or need to share driving duties on a long journey. Taking out temporary insurance will not affect the no claim discount on the vehicle's main policy, while short-term cover for full business use is available. You will benefit from uninsured loss recovery, while optional extras such as temporary breakdown cover and comprehensive cover for driving in Europe can be added.